Here's a quick tutorial on how to add "Pay with STEEM / SBD" options to your Shopify store! Within your store's admin control panel, navigate to Settings > Payments and choose "Create custom payment method" from the dropdown in the "Manual payments" section. 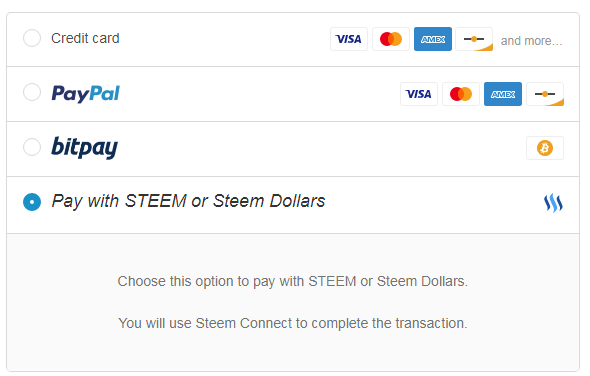 Choose this option to pay with STEEM or Steem Dollars. You will use Steem Connect to complete the transaction. Please choose a payment method below. 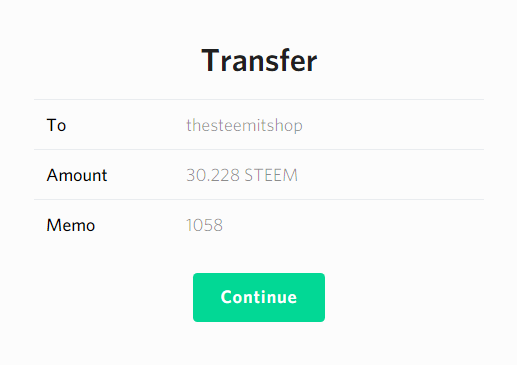 Doing this will allow you to insert the STEEM logo during payment selection. In the admin control panel, navigate to Settings > Checkout and place the following code under "Additional scripts"
steemitAccount = "thesteemitshop" //Change this to your Steemit account name where you would like to receive payments. Fetches the current STEEM price using the coinmarketcap.com API. Extracts the total final price and order number. Calculate how much STEEM or SBD is needed to pay for the order. Generate Steem Connect links for payment, placing the order number in the memo field of the transaction. Now customers will be able to checkout using STEEM/SBD and it will be easy to track because the order numbers will match up with transaction memo fields! Thanks for reading, hope it will be a help to some of you out there, and if you have any comments, concerns or suggestions please don't hesitate to mention them below! Thanks! We have to get busy.org shirts up there soon! This is awesome, will be using this! Does the STEEM or SBD get converted to dollars or Bitcoin or will I be receiving STEEM/SBD directly? I am drop shipping and am concerned about how I will be paying my suppliers. You will be receiving STEEM/SBD. It is still up to you to liquidate and get cash to pay your suppliers. We simply trade the STEEM/SBD for BTC and sell it coinbase. Ok, thank you for the answer. Have you considered using BTC and Bitpay to run the store rather than selling the BTC? I would rather do that if at all possible. We currently do have a bitpay option, although nobody has used it yet. STEEM seems to be the preferred payment method on @thesteemitshop. After "Pay with STEEM or Steem Dollars" is selected does to customer have to proceed further to input information? Also if that is the case can someone back out before they input the information but order the item? Yes they can back out simply by not sending the steem, as obviously you wouldn't end up fulfilling a non paying order. Hey sorry to bump this old post, does this still work? I tried to follow your instructions, but the payment option does not appear, only the new payment option and checkout text. no steem connect button tho during checkout. I moved the code to the header, etc, using xocode, and even tried properly quoting and concat echoing the button info to the dom, and so on - nada. any up to date advice? nevermind I rolled up my own solution and made it work tonight. Hey I just tried to put this into my store and it linked up with my coin base option over my new Steemit Option. Any idea how I can fix it? The @OriginalWorks bot has determined this post by @adept to be original material and upvoted it! Thank you very much! I'm trying to use Steem API for implementing solutions like this. You really gave me a great help with this. Great news! Any numbers on how many shops are using this feature already?